Now you are able to run the ‘rpi-update’ command. To control if you upgraded your Raspberry Pi, run the following command to see your operating system number. In my case, I upgraded from 3.10.25+ #622 to 3.10.33+ #654. 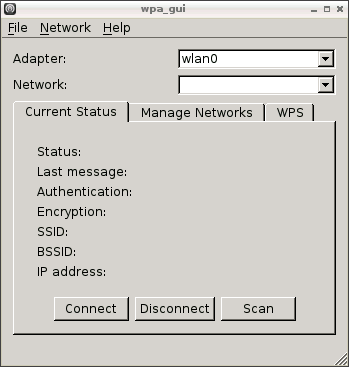 Now, you can use WPS to access your network or perform a scan to detect all possible network in your environment. After each operating system update, the driver changes. To install the driver for your RP version, you can find the dropbox link here. Reading this article is really recommended! Did you eventually find a way to make your wifi dongle works and go through the above steps? yes, exactly. And if you are using raspberry PI 2 then make sure you get the -v7 version of driver. It worked for me. After getting the correct file for my Pi version, it worked first time. Good job! Thank you very much for this post. Now,I can remote my raspberry with my laptop with wifi. Excellent post Laurent, this worked perfectly for me! My Pi now has a flawless wifi connection. Hi, normally that command should work… maybe Google knows? I don’t… Hopefully you get it fixed soon! I just tried to follow these instructions – but fail at the first step as dropbox returns a 400 error. Is is possible that the files have moved since November? I have also tried other suggestions online – but these fail at the point where you run a ‘modprobe 8188eu’ after the ‘depmod -a’. … which indicates the wrong driver version for the kernel. Many thanks – I had made a mistake when I copied the specific link for the version of Raspbian. With the correct driver file, everything runs successfully – but on reboot of he RPi, I need to run startx again and ‘connect’ the wifi. This means that I need to plug in the lan cable too … I really wanted to just run on wifi for the more portable application. How can I get the RPi to automatically connect the wifi on boot? Hi, my tp-linnk tl-wn725n lost connection after a period of time. Do you know the reason? Plzzzz, show me a solution for this. Thanks you. Have you upgraded the RPi system since you loaded the wifi driver? The driver version changes with the Raspbian build….. You may have to download a new driver. I’m also getting this error. Did anyone figure it out yet? Thanks, it seems to be working great. Now I can run Pi “Headless”–I think. I am trying to use berryboot with the TP-WN725n in a hotel. After the drivers load the menu finds the wifi network name ” residentsinn_guest” and asks for a WPA password. The network is open but runs through a connection proxy so I called support and they manually gave the mac address a lease so I do not have to login through the browser. I click OK, and it fails to get an IP address twice. Is it possible for me to save a new driver file and change some confg files while I am in windows and recopy to the card, then restart to get this working? If so, any ideas what I need to change? There should be a specific hell for those who post Dropbox links for RARE drivers, and then later delete the file in their Dropbox. To the original poster of that Dropbox link, I want you to know you’re the salt of the earth. I am running a Pi 2 board, TL-WN725N V2.0. I can’t get it to work! I’ve followed the instructions several times now (including reflashing my pi and doing it again) and I still can’t get it to appear in the gui.. I’m using the latest version (3.18.10), any ideas? Got it working! I unplugged the dongle and then put it back in, the pi rebooted automatically and then it worked! HI, I had the same problem but, when I plug my dongle my keyboard doesn’t work so I cannot even write my username and password. I don’t know what can I do. If you have only one USB port the consider connecting via LAN and SSH. If your keyboard doesn’t work when too many devices are plugged, try a better power supply because maybe it have not the sufficient current to work! As a new RPi user I have finally succeded in following your instructions on how to get the TP-link nano wifi adaptor working. I could not have made it without your help. Thank you so very much. Hi, I have been using my 725 along with these drivers for about 6 months but when I updated my Pi it stopped working. I backed it up and installed the latest version of Raspbian and updated it to 3.18.11+. When I installed the correct version of the drivers for my 725 my Pi got ridiculously slow(it takes like 40 seconds to log in and all input lags). Anyone who knows a way to solve this? HTTP request sent, awaiting response … 404 not found. Tried this but cannot get my RPi to find my wireless adapter. WPA_GUI return no options for adapter, any thoughts? thanks. New pi2 instructions worked first attempt. Thanks Laurent. My RPi is upgraded to Kernel 4.1.6-v7+. It is working fine with TL-WN725N. Good work from you. Do you know any software that controls a wifi ip camera ? If so which wifi ip camera model ? THANK YOU!!!!! Thank you thank you thank you! “could not insert module /lib/modules/3.18.7-v7+/kernel/drivers/net/wireless/8188eu.ko: Unknown symbol in module”, uname -a outputs my OS details as “Linux raspberrypi 3.18.7-v7+ #755 SMP PREEMPT ….” and the driver I have downloaded is “8188eu-v7-20150212.tar.gz”. Hello! First of all, thank you for a great post!! But, im a total newbie and i did everything after a hell of a lot what id call a sweaty brain-work outwork but now it came down to this, the wpa_gui icon is in the right upper corner but i doesnt say anything after Adapter, meaning nothing is found. My internet router is connected directly, by cable, into my raspberry pi. Is that why it dosent work? I have a really easy fix for this problem. I just plugged in the network adapter to the Pi and my ethernet was connected to my router then I reinstalled Raspian and now the wifi works! I have Raspberry Pi 2 Model B and TL WN-725N ver 2, try it! After, i upgrade it i get Linux raspberrypi 4.4.38-v7 #938 SMP … , How can i install this driver? [ 135.743] (==) No Layout section. Using the first Screen section. [ 135.743] (==) No screen section available. Using defaults. [ 135.745] (==) No device specified for screen “Default Screen Section”. [ 135.745] (==) No monitor specified for screen “Default Screen Section”. [ 135.745] (WW) The directory “/usr/share/fonts/X11/misc” does not exist. [ 135.745] Entry deleted from font path. [ 135.746] (WW) The directory “/usr/share/fonts/X11/cyrillic” does not exist. [ 135.746] Entry deleted from font path. [ 135.746] (WW) The directory “/usr/share/fonts/X11/75dpi/” does not exist. [ 135.746] (WW) The directory “/usr/share/fonts/X11/75dpi” does not exist. [ 135.746] (II) The server relies on udev to provide the list of input devices. [ 135.781] (EE) Please also check the log file at “/home/pi/.local/share/xorg/Xorg.1.log” for additional information. [ 135.789] (EE) Server terminated with error (1). Closing log file. The easiest way to install this USB Wi-Fi Dongle is to use this script that MrEngman made and posted on the Raspberry Pi Website.